OK, so be it, enough about “Bad times”… but how does translate this to our aircooled Vw world? Well something very strange appears lately… Country’s where recession hits real hard, and where (as we may believe ) insiders tell us unemployment raised above 50!% the VW hobby is growing faster than ever. If we look in the for us fastest growing country’s we may calculate Greece and Spain in our top ranks, these both country’s performing very poor in general but not in VW hobby! Unemployment seems to give people more time to spend with their beloved cars and give them a certain comfortable feeling with the other wasted time. Maybe we have to look at it as a certain therapy. But there is more…. Last couple of months a new breed of collector is popping up. Let’s call him the “investor” type. Someone with a healthy interest, but not therefor a passion. Someone who very well understand that the right bought, right car is a safe heaven investment. Why? Well every day there is more people worldwide that can afford to buy a classic car. The number of collectable cars is known, new cars will not become collectable, except for some “mavericks”. Banks winning disrespect, no respect, with their behavior so not reliable for investments or saving. Interests been to an all-time low, more low then inflation, having money cost You money at the moment. Stock markets have no direction at the moment unless “down”. Cars, as many other collectibles, can be moved fast, or “shipped”, to “new” economy’s as China, India, Russia or Brazil to only name a few…. And that’s a classic car’s advantage against real estate. In a total recession, with a large inflation (what will come whatsoever) will also house, land or industrial property go down in value, against the rightly bought Classic car more than likely will win in value on foreign markets. A smart vision from the new breed collector, don’t You agree. We always try to give the best possible service. As from 1st January 2012 we are however obliged to charge 1,85 % handling costs for payments with Visa or Mastercard. We count on your understanding and assure you that we will, as always, save neither time nor effort to provide you with the best possible service. # 1896 Bugpack crankcase breather kit instead of "Crankcase breather kit"
Following items have been replaced by a superior and better quality! We’ve experienced for many years that restorations are made much more thoroughly and therefore one is inclined to spend more money for quality products. This positive tendency makes that BBT is busy looking for high quality material. These door latches fully comply to these requests for quality and can be delivered from now on each for 0426-005 & 0426-205 and as pair for 0427-250 from stock. This support can be found on the top at the right side of the engine lid on Type 2 buses from model year 1955 till 12/63, the moment that this engine lid support was replaced by a spring model (BBT # 0438-272).When the original engine lid supports have been used for many years they get too much play and won’t do their job anymore and the engine lid will no longer be properly locked. It provokes a lot of annoyance when the engine lid can’t be held open for repair or maintenance. From now on these supports + spring are available from stock under ref. # 0438-271, the spring can be obtained separately under ref. # 0438-271-5. With this original look shift knobs you can replace without problems your torn or lost item. Available each from stock in 7 mm (# 0514-730) for Type 1 08/60-07/67 and 10 mm (# 0514-705) suitable for Type 2 03/55-07/67 version. Since more than 25 year BBT delivers the Trigger shifter for Type 1 (#0507) and Type 2 (#0509) from stock. It isn’t astonishing that the dust protection seal of this shifter, purchased a long time ago, needs to be replaced. From now on we can deliver this boot each from stock. 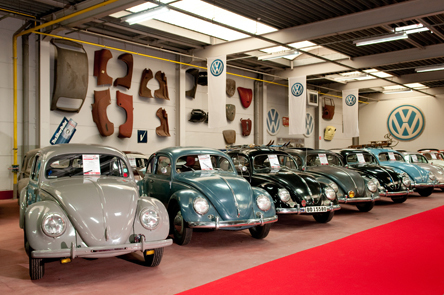 There are some places on the body of our VW beetles which are very susceptible for rust. Most of the times damage is situated around the wheels, but at the underside of the A-pillar there is also often damage by rust. This point is very susceptible for friction which the body endures during use of the vehicle. The second cause is definitely due to assembly of the door on the A-pillar, which causes also friction on the A-pillar, particularly on the connection of the A-pillar on the lower heater channel. Frictions cause hairline cracks on the paint and welding, resulting damage by rust. There are for quite some time reproduction hinge spare parts on the market, though fit and quality are in no way equal to those which we have now for sale. The hinge fixations are available each for each side for model year with 4 door hinge bolts – 07/61 and for the model with 3 fixing bolts for model year 08/61-. VW Karmann Ghia has many fans due to its look and solidity, though the complexity of the construction of the body makes that it’s very susceptible to rust. This complexity makes that it’s not an easy thing to repair the plate work. That’s why we’ve been looking for good plating repair parts to complete our wide range and to facilitate restoration. # 0889-002/-015/-016/-017/-018 will contribute to the repair of the nose, susceptible for accidents and rust. . # 0889-230/-240/-270 are the perfect solution for the repair of the rear side of the body, whereas # 0889-330/-340/-600/-601 enable a solid repair of the heating channel and the connecting bottom hinge pillar. All these parts are available each for each side from stock. We are always working to improve the quality of our products and renew regularly our range with better quality products. These inner side panels too are superior in comparison with those we already have in our offer (0891-290/291/292/293) what facilitates repair of thresholds in a better finish. It stands for more durability. From now on available each for each side from stock. These supports are essential for a correct and lasting assembly of the silencer on Type 25 buses with water boxer engines and in general they must also be replaced when you install a new silencer. From now on we can deliver these supports per side from stock for standard models as well as the syncro version. Meanwhile our NOS stock has been run out and it was necessary to enlist these tower rubber stops and accompanying dust cap in our range. The rubber dries up and hardens and consecutively tears. It loses its function as rubber stop and dust cap. # 1314-100 is assembled on the top of the strut of the first model (Super Beetle 1302) equipped with the MC Pherson suspension and on the first year of production of Super Beetle 1303 -07/73. You can recognize it in the way how the spindle is fixed on the strut by means of 3 vertical assembly bolts. # 1314-110 is used on the 1303 Super Beetle model from 08/73 – 01/80 on which the spindle is assembled on the spring guide by means of 2 horizontal bolts. The dust cap to protect the upper side of the shock absorber is identical for both models and is available under # 1314-150. All these parts are sold each. This steering box mounting shackle is an essential part which should always be in impeccable condition to keep the steering box fixed on the front axle. Sitting underneath the car this part is very susceptible to rust and can’t be used again upon disassembly and assembly of the front axle. From now on we can deliver this mounting shackle in a good quality from stock for the assembly of the steering box on Type 1 and Type Karmann Ghia models from 08/65. Owners of Type 25 buses also have the feeling for tuning of their favorite classic car and lowering their vehicle is a common practice, which one executes to obtain a better road-holding and nice looks. The lowering work can be done without any problems with these lowered springs and of course with the correct tools. The set lowers the vehicle with an average of 60mm depending on the type of the car. From now on available from stock in a set consisting of 4 suspension coils. During the move of BBT in Spring 2011 we’ve done more than just moving parts from one warehouse to the other one. We’ve also made an inventory of used parts and from now on we can offer these parts. Parts foreseen with suspension springs have the nasty peculiarities to rust near the spring cone. In the case of the rear Type 1 1302/1303 Super Beetle trailing arms rust damages often the spring stop or the seat for bearing gets damaged by a bad wheel bearing. The used parts which we present today have all been controlled and are good to be used again. Available each & per side. These seals can be found underneath the vehicle near the transmission nose cone. They take care of the sealing between the transmission nose cone and the chassis and they prevent damage to former part. Due to age, grease, dirt and humidity these seals harden and can’t be used again after restoration or repair. 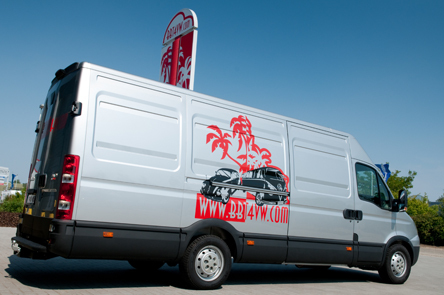 From now on we can deliver them each for Type 1 '61-'79 (# 1419), Type 1 '52-'60 (# 1419-001) and for Type 2 (# 1419-200). These complete pipe sets can be found between the injection pump and injectors of type 25 25 1.6l & 1.7l diesel engines. Polluted fuel or damaged connections can make these pipes of no use and pipe sets must be replaced. # 1687-500 is destined for 1.6l diesel (CS code) and 1.7l diesel (KY code) engines, whereas # 1687-505 is only suitable for 1.6l turbo diesel engines. From now on available in a complete set from stock. For quite some time we've the piston and cylinder kits for 30 HP Type 1 engines from the manufacturer AA Performance in stock. There is still an important demand after authentic material for the revision of engines and in order to meet the wishes of these customers we’ve decided to expand our assortment of cylinder – piston kits with the well-known brand Kolbenschmidt. Available from stock in a set of 4 cylinders, 4 pistons, 4 piston pins and 8 piston pin clips. This PVC oil filler tube can be found at the belt pulley side of 1.6D, 16TD and 1.7D diesel engines. We regularly get demands after this part because the original one has been damaged during disassembly and/or the material has become fragile due to influences of continuous temperature fluctuations. From now on we can deliver this part each from stock. We are continuously expanding our range of parts for the maintenance of Type 25 engines. With this spark plug you can do the maintenance of DF and DG water boxer engines in a correct way. A standard water boxer engine needs for a proper working 4 of this spark plugs. From now on available each from stock. This rubber made 90° elbow is located at the left of the air cleaner box on Type 4 based engines, Type 2 buses starting from model year 1972, type 411/412 and Type 25 air cooled 2.0l engines. Due to its mounting next to the engine this rubber part is very susceptible to influences of heath and corrosion by oil. This rubber elbow can be delivered as from now from stock. The products of Auto Meter are a very popular item in our vast offer. We’re very proud to have continuously such an extensive assortment available. Fans of these products can put their favorite products even more in the spotlights. The small stickers # 2604-000 are available as a set of 3 pieces, the big ones are delivered each.